The Labrador Retriever is the original water dog, with a weather resistant and waterproof coat and an "otter" tail it uses to steer like a boat's rudder when swimming. Its heavy body set and strong legs enable the Labrador Retriever to powerfully swim and run - and frequent exercise is needed to keep the Labrador Retriever dog breed healthy and occupied. Amicable and sociable, the Labrador Retriever is a playful companion and a calm housedog. Labs are extremely obedient and eager to learn and have a recognized place in the workforce alongside their human companions as guide dogs, explosive and drug detection dogs. The Labrador Retriever is an excellent therapy dog, a growing occupation for many breeds. These dogs bring company and joy to nursing homes and children's care facilities. Labradors are the most popular breed worldwide, a record recognized in 1991 and remains true to this day. As the name suggests, The Labrador Retriever originated from the Canadian province of Newfoundland, along the East Coast of Canada. The Labrador Retriever did not come from Labrador. Male Labrador Retrievers range from 22.5 inches to 24.5 inches. Female Labrador Retrievers range from 21.5 inches to 23.5 inches. Male Labrador Retrievers range from 65 to 80 pounds (30 to 36 kg). Female Labrador Retrievers range from 55 to 70 pounds (25 to 32 kg). Care should be taken as Labs are frequently allowed to become overweight, significantly increasing health risks for any canine. Labrador Retrievers may be black, yellow or chocolate. Labrador Retrievers have a short, straight and dense coat. Their coat is easily cared for with once a week grooming. They do shed, usually twice a year in normal climates so be sure to brush your Labrador regularly to keep this to a minimum. The Labrador Retriever is a kindly, outgoing dog breed. 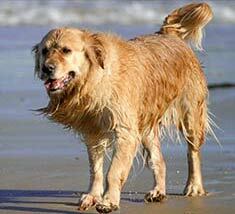 Easy to train, this water-loving dog breed is superb with children. When choosing your Labrador puppy, be sure to check out the temperament of the parents. Although Lab’s tend to have great temperaments for being around a family home and children, pay special attention to how the puppy’s parents behave. Behavior traits can be inherited and good behavior in the parents can indicate the future temperament of your puppy. Labs are highly intelligent and trainable, love to play and are extremely friendly. They crave human companionship and attention and need to feel like they are "part of the family" to be truly happy. Their loving nature and attachment to humans does not make them good watchdogs, however. For that, think of a German Shepherd companion for your Labrador puppy. 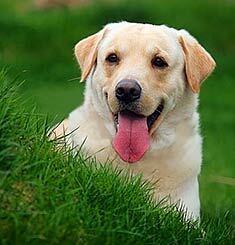 The Labrador Retriever is susceptible to skin allergies, epilepsy, eye diseases and joint problems. Labradors can be prone to hip and elbow dysplasias which are potentially crippling abnormalities of joint formation that can be inherited from the dog’s parents or relatives. An x-ray examination of both parents and as many ancestors as possible indicating that they are free of this abnormality will help you avoid this condition in your pet. The expected life span of the Labrador Retriever is 10-12 years. Labrador Retrievers need frequent exercise to stay happy and healthy. An urban or country environment with a fenced yard is ideal for this high energy dog breed. Labrador Retrievers love water and enjoy both swimming and retrieving. If you have decided that a Labrador Retriever puppy may be the right choice for your family, there are a few other things that you have to consider. You need to be aware that your Lab puppy will grow and will require proper exercise on a daily basis. Do you have the space in your house to accommodate such an animal, or a fenced in yard so that your dog can go out safely? Will you have enough time to spend on grooming your pet, and also on the training that may be required? Are you willing to spend the resources the keep your pet healthy? The Labrador Retriever is in the Sporting group. Who can forget when President Bill Clinton introduced the world to Buddy, the romping Labrador Retriever he took to the White House? Full of energy, the Lab makes a great family pet, as well as a hard-working dog. Labs are not, for the most part, terribly territorial, aggressive, or destructive, although they do have a LONG puppy-hood, taking at least three years to become less rambunctious. Required reading for any Lab lover: John Grogan’s touching, funny, and poignant books, “Marley and Me” and “Marley: A Dog like No Other”. The two books detail life with a yellow Lab, showing not only the breed’s boisterousness, but also the love they bring into any home. Marley was rescued by Grogan as a puppy and really gave him a run for his money as they tried to break him of some of his more annoying habits. Although you are never quite sure whether Grogan or Marley is the master, the book grabs at your heartstrings and never lets go. As retrievers, Labs instinctively want to hold things in their mouths, but are very gentle about it. Anything will do for this purpose – chew toys, arms, legs, small children. (Just kidding, I think.) They are even said to be able to carry raw eggs in their mouths without breaking them, should you ever have a need for this. As the name suggests, Labrador Retrievers were bred and are still used as hunting dogs, to retrieve birds that have been shot down. Their soft mouths and slightly water-repellant coats allow them to bring back even waterfowl with very little damage to either themselves or the birds. For non-hunters, Labs also perform many useful functions. They are often used as assistance dogs, rescuers, and even soldiers. A recent story out of Iraq tells of two K-9 therapists being used at Contingency Operating Base Speicher’s Combat Stress Control Unit. Sergeant First Class Boe, a member of the 85th Medical Department, helps prevent and control the stress soldiers experience living in combat zones. Boe and another black Lab were donated by Amerca’s VetDogs to encourage soldiers to interact with dogs as a means of relieving psychological stress. It has long been acknowledged that interacting with pets can lower blood pressure and improve feelings of well-being. Military occupational therapists are capitalizing on this by providing dog therapy to soldiers separated from home and family. Whether they play fetch with Boe or just spend a few minutes petting her, the results are readily apparent. Major Charles Kuhlman, an army chaplain, notes that soldiers often befriend stray dogs. Some of them even going through yards of red tape to find a way of bringing an adopted dog home when their deployments end. “Dogs make a huge difference in morale,” says Chaplain Kuhlman. America’s VetDogs is part of the non-profit organization Guide Dog Foundation for the Blind, which has provided service dogs to the visually impaired since the 1940’s. The Lab’s native intelligence and friendly, outgoing personality make him a natural as an assistance dog. It is estimated that 60 – 70% of the assistance dogs in the United States are Labradors. And assistance dogs are not just for the blind anymore. Goodwill Industries in Canton, Ohio raises money to train and foster dogs through its “Applause for Working Dogs” program to assist the physically impaired. Labradors can be trained to open refrigerator doors, carry a telephone to the wheelchair-bound person, and even assist a person who has fallen in getting back up. Endal, a famous service dog in England, was decorated for Animal Gallantry and Devotion to Duty for placing an unconscious human in the recovery position, then fetching the person’s cell phone and placing it near his ear on the ground. Endal then pulled a blanket over the person and barked at nearby houses to get help. One of the more interesting uses of assistance dogs is with those who suffer from epilepsy. Using their keenly-honed sense of smell, Labradors can sense when a person is about to have a seizure. The dog then backs the person into a corner, where she can slide down the walls rather than falling, when the seizure strikes. Labrador retrievers have also earned their stripes as search and rescue dogs. Jake, a black Lab, became a national hero in the United States when he searched for survivors following the terrorist attacks on the World Trade Center and after Hurricane Katrina. Lucky and Flo are twin Labs who earned Malaysia’s outstanding service award for their counterfeit detection skills. They found nearly 2 million pirated DVDs worth several million dollars, leading to the arrest of six counterfeiters, who were said to have put out a ₤30,000 contract on their lives! Labs are also known as extremely loyal dogs. Lizzie, a black Labrador from Helena, Montana, was recently caught in an avalanche. After searching for her for several days, her owners became convinced she had died. About a week after the accident, they received a phone call from a neighbor who had found the dog! Not only had she survived, she had nearly found her way home to her beloved owners. There’s no doubt about it: the Labrador is a special breed; however, there are some things you should consider before owning one. Labs are the most popular breed by far in the United States, having more than twice as many registered dogs as the next most popular breed. This popularity has led to an increase in the number of irresponsible breeders who are in the business only to make a quick buck. It is worth taking the time to research and find a reputable breeder when purchasing a Lab because of the breed’s tendency for hip dysplasia. The breeder should X-ray his breeding stock and only use animals with an OFA or PennHIP clearance for breeding purposes. You can do your part to prolong your dog’s healthy years by keeping him at a healthy weight through proper diet and exercise. Because Labs reach their adult weight of 60 – 70 pounds by the age of six or seven months, it is imperative that training be started early while the dog is small enough to be controlled. These dogs are very strong and rambunctious. If you wait too long to train them, you will find yourself in the unenviable position of being dragged and wrapped in the leash rather than enjoying a nice leisurely walk. The outgoing personality of a Lab also makes it essential that they be trained to sit and shake hands instead of jumping up in greeting. Owning a Lab puppy requires a commitment to giving them plenty of exercise. Allowing frequent play time in a fenced yard, providing daily walks, and playing innumerable games of fetch are required to keep the dog in good physical and mental shape. Because they are retrievers, Labs love to play hide and seek, looking for toys that have been placed under couch pillows or blankets. Left to their own devices, Labrador puppies will become wanderers, chewers, and diggers out of sheer boredom. Labs are quick to learn and eager to please, so training is fairly simple. Repetition and consistency are key to overcoming misbehavior. Take heart, every dog eventually does grow up! Their winning personalities and hearty appetites make Labrador retrievers ripe for over-eating and obesity. Owners must be careful to limit the number of treats given to Labs, particularly as they grow older. Regular exercise is required to prevent the health challenges that result from being overweight. Obesity is considered the number one nutritional problem in dogs, with at least 25 percent of dogs being overweight. Scientists conducting a study sponsored by Nestle Purina PetCare have found that a dog’s life, like a human’s, can be extended by maintaining a strict diet and regular exercise regimen. An important consideration when choosing a Labrador is that the breed does shed a fair amount, particularly in the spring and fall. Lab hair is fairly short and straight, but carries enough dander to make it a concern for allergy sufferers. As attention-loving dogs, they enjoy the interaction that grooming affords. Frequent brushing or combing can reduce the need for frequent dusting and vacuuming to pick up shed hair. Recently, Labradoodles have been bred as a designer hybrid of Labrador and poodle to make the dog more suitable to those with significant allergy concerns. Ever wonder why Labrador retrievers come in three colors? Color is determined by several different genes. The E-locus gene determines whether or not pigment granules are present in the dog’s coat. An absence of pigment results in a yellow Lab. Variations in other genes control the subtle details of coloration resulting in shades of color from white to light gold to fox red for the yellow Lab. Assuming the E locus gives the dog some pigment granules, the B locus gene then determines the density of the pigment granules. Sparse granulation gives a chocolate coat, while dense granulation results in a black coat. The nose of a chocolate Lab or black Lab will reflect its coat color. However, a yellow Lab usually has a black nose which turns pink with age. This color change is a result of the dog producing less of the enzyme tyrosinase which controls the production of melanin, responsible for the black color of the nose. Dogs produce more tyrosinase in the summer, less in cold weather; therefore, a yellow Lab’s nose will appear darker in the summer than in the winter. The pink nose is sometimes called snow nose or winter nose due to this phenomenon. As you have seen, Labrador retrievers can make great pets and working dogs. With proper attention to his high energy needs, both the lab and his owners will survive the dogs’ rambunctious early years, allowing the dog to grow into a true asset and wonderful companion. 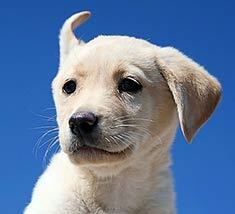 Find Labrador Retriever Puppies with our Free Breeder search!